It is with great sadness that we have learned that Liverpool chess Club second team captain Tim Miles has passed away this week. Tim has been unwell for the last 12 months but was only recently diagnosed with a terminal illness. Jim Gallagher and Sean Frost visited Tim recently in Marie Curie Hospice where he was in his usual great spirits despite his condition and donated many of his chess books to the club. Tim can be seen here winning the Liverpool Blitz championship for 2018 less than 12 months ago which he was very proud of. He was also delighted to take on the Liverpool 2 captaincy this year and had proved to be a very strong player for Liverpool over the last few seasons. Tim was also senior lecturer at Liverpool John Moores university as well as a stand up comedian. He will be very sorely missed at Liverpool chess club but he will be remembered as a great chess player who stepped forward to help out at the club with great enthusiasm and humour. Our deepest condolences go out to Tims family from all members of Liverpool chess club. Liverpool juniors were officially crowned Merseyside (adult) league Division 5 champions tonight when they won their penultimate match against Liverpool 4. 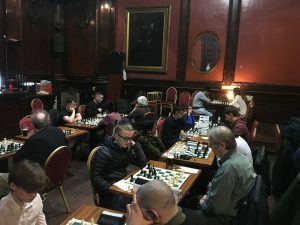 Nikolas on bd2 won early on against Aiden Hernamen and brother Marek won soon afterwards on board 1 against Sean Robinson. Frank Hudson also won against Orhan after an Evans gambit attack was unstoppable to secure the match and the league title for the juniors. Luke Maher went a few pawns down which eventually told against Nick Davison who saw home the win to make it 3-1 before Bashar Rovezi won s great tactical battle against James Rigby to make the final score 4-1 to the juniors. So Liverpool juniors are league champions and onto Division 4 they March! Congratulations chaps! It is with a heavy heart that Liverpool chess club will be leaving their current home The Crown Pub on Lime Street where they have been based for a few years now. Thank you to Manager Neil, Karen, Tom and all the staff at the Crown who have always treated us brilliantly. The Crown has been a fabulous venue but is now getting a refurb in Feb so will close temporarily and reopen as a much classier bar. A new venture once again for our historic club! We look forward to seeing many of you there soon! The Merseyside junior chess league was in full operation today at Merchant Taylor Junior Boys school in Crosby. Teams from Liverpool, Wirral, Southport, Bluecoat and Merchant Taylors competed for this years Division 1 and Division 2 titles. In Division 1 Liverpool dominated having won all games without losing a game including a 5-0 win over last years champions Wirral. Wirral are in 2nd place followed by Liverpool 2 and Southport with Bluecoat 1 and Merchant Taylor Girls A propping up the table in a very tough league. MCA Division 2 is a different story with a few teams still in with a chance of clinching the title. Wirral 2 lead the way closely followed by Bluecoat 2 and Merchant Taylor Juniors 1. The next round of games will be interesting and unveil the Division 2 champions. All to play for in an ever expanding Merseyside junior league. Thank you to Merchant Taylors for hosting the event and providing refreshments. 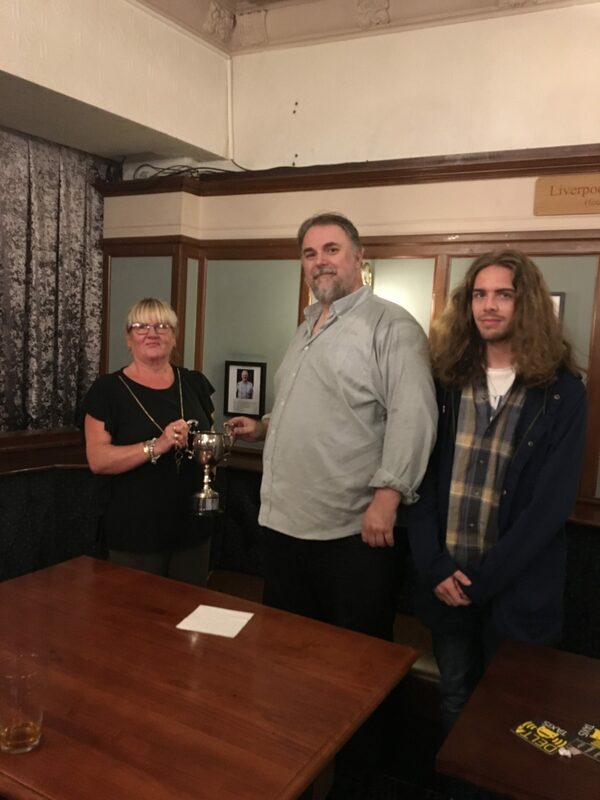 Liverpool Chess club held its annual Handicapped Blitz evening last night with the winner taking home the Frank Ryan and Billy Cooper Memorial Trophy which was won last year by Piotr Lipka, Franks widow Doris Ryan once again presented the trophy to the winner. We had a 20 strong turn out for the event which ran for 6 rounds with each game lasting 14 minutes, higher graded players may only have 3 minutes v 11 minutes for a low graded player to give everyone a fair chance of winning. Early results saw some top v bottom games with top players only having 3 minutes on the clock with some upsets Sean Frost (81) winning against Ali (198). So after 2 rounds we had Ste Lloyd, Sameer Mana, Tim Miles on 2/2 and Tomas, Chris Halfpenny, Paul Taylor Mike Clarke and Rob Steele on 1.5/2 setting the early pace. Round 3 saw a few leaders drop points with Tim out alone in front on 3/3 and Tomas Chris Halfpenny, Paul Taylor on 2.5 and Ste Lloyd, Sameer get joined by Sean Robinson, Peter Mellor and Dave Leeming on 2/3 in the chasing pack. Round 4 saw the break away start to unfold with Tim Miles on 4/4, Tomas Lancaric on 3.5 and Ste Lloyd and Sean Robinson come strong to reach 3/4. After Round 5 with just one round to go Tim was still at 100% on 5/5 with his new closest rival Sean Robinson 4/5 and Tomas and Paul Taylor on 3.5, Ali Rashid Amin, Sean Frost and Pete Leonard made a strong run to get to 3/5 alongside Ste Lloyd and Sameer but too late to challenge for this years title. In the final round Title decider between Tim and Sean, Tim got the needed draw to seal the winners award with 5.5/6 and get his name on this years trophy, with Sean Robinson and Tomas Lancaric finishing in second place on 4.5/6. Ste Lloyd and Ali finished joint 4th on 4/6 and just behind them Sean Frost, Paul Taylor and Mike Clarke on 3.5/6. Tim can be seen being presented this years trophy by Doris Ryan alongside runner up Sean Robinson. A great competition for all involved, played in a great spirit and atmosphere by all players. Ali Rashid Muhammed Amin is new 2018 Table Winner! The Prestigious Liverpool Table tournament 2018 has been won by Newcomer Ali Rashid Mohammed Amin. Congratulations Ali! Ali won hs final game against Nick Hawkins last night to ensure getting his name on the Historic Liverpool Table as the 2018 Winner. Ali won all of his games in this years tournament which is a fabulous achievement. The Liverpool table has been running since 1892 when James Cairns won the tournament and Amos Burn won the tournament a few times including 1894. 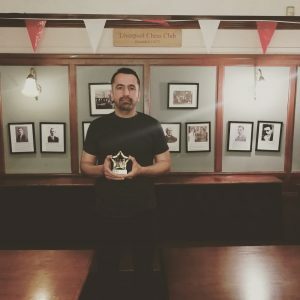 Posted on 20th June 2018 20th June 2018 Author James GallagherCategories UncategorisedLeave a comment on Ali Rashid Muhammed Amin is new 2018 Table Winner! 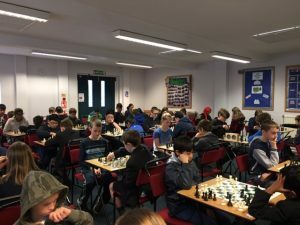 April 2018 – Liverpool Chess club have at last managed to win the Merseyside Division 2 league and regain their place in the Merseyside Division 1 league after 12 years outside the top flight which they dominated for most of the time since its foundation back in 1837. This has been the main aim the club for a very long time and it is a great achievement for all involved after it had looked like the club would collapse on many occasions over the last 10 years. The club now expects to have at least 5 teams competing in the Merseyside league next year as well as the junior team who also play in the MCA junior league. The Liverpool teams have all made good starts to this seasons league campaigns. Liverpool 1 have won 2 from 2 games so far and newly promoted Liverpool 2 have won 2 games from 4 games with wins against some top quality opposition in Aigburth 2 and Southport 1. Liverpool 3 have won 2 from 3 games so far which sees them in the top half of Division 3 and Liverpool 4 are mid table in the newly merged Division 4 league. Liverpool are still in both the Knotty Ash and John Ripley Cups and the Junior League will start very soon.